Final Expense Insurance - Learn About Funeral & Burial Coverage - Victor Zavala Insurance Services Inc. Protect your family from the burden of an expensive funeral. Speak with our burial insurance specialists to learn more about your options today. What is Final Expense Insurance? Final expense insurance is an insurance policy used to pay for burial expenses and funeral services when the named insured dies. Such a policy helps ease the financial burden placed on a family when a loved one dies. Final Expense insurance is a basic issue life insurance policy that covers people until they reach 100 years old. It is quite similar to universal life insurance and is sometimes referred to as graded life or burial insurance with easy issue permanent coverage. As an inexpensive insurance choice, final expense coverage can be used to cover the funeral and burial costs of the policy holder. Most people who do not want to place a hardship or burden their families with these burial and funeral costs will take out burial insurance polices. Burial premiums can begin with higher costs at first than other forms of insurance since they include cash value features. An important advantage of burial premiums is that they are fixed, which means they remain the same even if your health deteriorates. 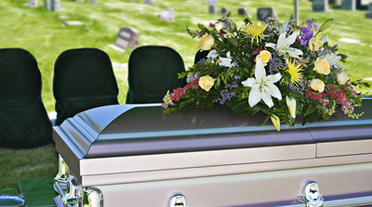 Final Expense coverage can pay for the casket, funeral service, visitation/viewing, hearse, digging and filling the grave, the actual cemetery plot, or burial vault or grave liner, minister, headstone, flowers, and other expenses related directly to named insured's funeral. Contact us to learn more about the right final expense coverage for you. Victor Zavala Insurance Services Inc.